Imitation is the most sincerest form of flattery, they say. For this week’s Statistically Speaking piece, I am going to take my cues from Doug Thorburn over at Baseball Prospectus and his latest Raising Aces article. Not only am I batting my statistical eyelashes at Doug, but I also hope that for those who aren’t already, you take a look at what the folks at BP are doing. If you’re still timidly dipping your toe in the sabermetric/advanced stat water, BP is as warm as they come. Back to Thorburn’s Under the Gun 2.0 article and the premise. Briefly, velocity is king when it comes to pitching. Not only does elite, or at least above average velocity help in getting hitters out all unto itself, but it also sets up other pitches, adding to (or detracts from) the effectiveness of a pitcher’s other pitches. A good fastball, both in terms of velocity and location, is what makes Stephen Strasburg’s changeup, Gio Gonzalez’s curveball, and Tyler Clippard’s changeup all the more devastating. Take away fastball velocity and things become a little more precarious. With less velocity on the fastball comes less disparity in the velocity between it and other pitches, which can allow batters better identify and adjust to an offspeed and breaking pitch, as they are no longer concerned about not being able to catch up to the fastball, should they guess incorrectly. Also, with less fastball velocity comes more focus from the pitcher on hitting particular spots in the strike zone, especially, the corners of the plate. Essentially, less velocity can mean fewer pitches to throw and a smaller strike zone to throw at, since any mistakes with the heater over the middle of the plate are now home runs, instead of foul tips or lazy popups that can come with good velocity. We are looking at the three-year period from 2011-13. Each of the pitchers in the charts below suffered at least a half-mph drop from each of the previous two seasons to 2013, as well as the loss of a full tick from at least one of the two years under the microscope to 2013. In order to qualify, a pitcher had to throw at least 500 pitches that qualified as fastballs or sinkers in each of the past three seasons. The numbers in the charts were calculated based on a weighted average of the pitch-speeds of four-seam fastballs and sinkers in each season. Using this as a starting point, I did a little more tweaking of the selection criteria, so it wasn’t as strict. Looking at drops in fastball velocity, I only looked at whether a pitcher had at least a half mile per hour drop between the 2012 and 2013 seasons and if they had a full mile per hour drop in velocity between 2011 and 2013. Instead of a 500 pitch criteria, I used 450 pitches of any type of fastball in all of the three seasons considered. Also, with regards to ‘fastballs’, I counted four-seam and two-seam fastballs as well as sinkers as ‘fastballs’. All pitch data was courtesy of the FanGraphs PITCHf/x cards from all Nats pitchers between 2011 and 2013. Weighted averages for all three fastball types were then collected across the three seasons. Overall, we have three pitchers who might be at risk for decreases in performance due to decreased fastball velocities—Ross Detwiler, Ryan Mattheus, and Tyler Clippard. Mattheus in particular is in more of a danger zone, suffering both a half mile drop in velocity between 2012 and 2013 and a full mile drop in velocity from 2011 to last season. Also of interest are the pitchers who have added velocity over time (results that are a negative number), with Ross Ohlendorf leading the pack, with a nearly two mile hike in fastball velocity over the last two seasons. What could this mean for 2014? It could lend pause to a big bounce back season from the likes of Mattheus, but it could also be statistical noise, brought on by the reality that both Detwiler and Mattheus suffered significant injuries over the last year-plus and these velocity disparities could just be a ramification of those setbacks. Given Mattheus’ results have been a double whammy for velocity declines, it could lend credence to larger issues with a return to his previous productivity in 2014. For Clippard, who has been very resilient over his career, the velocity drop could also be concerning. However, further improvements to his command of the fastball and changeup, as well as the incorporation of an additional pitch could help offset any significant issues with declining velocity. The news of Clip toying with a split-finger fastball late last season while additionally slowly incorporating his breaking ball into his repertoire last year point to him adding to his fastball/changeup combo, possibly in order to combat some of the effects of dwindling miles per hour on his trademark up-in-the-zone heater. With a 2013 cumulative 16.4 (FanGraphs) wins above replacement amongst the staff as evidence, it’s clear that the Nationals are heavily reliant upon their pitching to lead them to victory. While there’s more to successful pitching than just displaying a ‘grip it and rip it’ attitude, the data as portrayed does show there being a delicate balance between fastball velocity and the overall value of a pitcher’s repertoire. It also shows the possibility of the previously rock solid Nats bullpen showing signs of wear and tear as they gear up for the 2014 season. Stuart Wallace is a Contributor to District Sports Page. A neuroscientist by day, the Nevada native also moonlights as an Associate Managing Editor for Beyond the Box Score, stats intern at Baseball Prospectus, and a contributor at Camden Depot. A former pitcher, his brief career is sadly highlighted by giving up a lot of home runs to former National Johnny Estrada. You can follow Stu on Twitter @TClippardsSpecs. It’s likely no coincidence that the four guys worst off here also have the worst timing and mechanics on the team. Mattheus and Gio have serious timing issues, when their lead foot plants, their shoulders are rotated forward and their pitching forearm is nearly parallel to the ground. That leads to a lot of extra stress on their shoulder and elbow joints–as their body is snapping their joins with extra force. 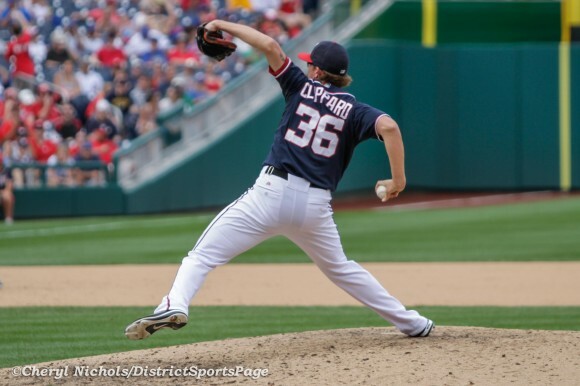 Detwiler and Clippard have similar issues. Zimmermann and Strasburg have some red flags as well in their deliveries, but they’re significantly better than these guys. Thanks for your observations — and you bring up a great point regarding the effects of mechanics and these velocity declines. Thorburn’s article went the extra distance and went into great detail with the mechanical inconsistencies of many on his list to watch out for. I agree with you, the four I mentioned have always had iffy mechanics, which could have led them to these declines or at least exacerbated the issue.